As many readers of this fine journal know, I am a full time numismatic dealer. I buy and sell coins, tokens, medals, and paper money. This gives me the opportunity to handle many interesting pieces of history. But these items remain with me for a very short time before being purchased by collectors. At shows I enjoy not only looking for coins or notes for inventory, but something for myself as well. Earlier this year I was trying to think of a coin that would be very beautiful, but very affordable. I was not planning on building a set. I just wanted a type of coin that I could buy some random examples of here and there, when I could not find items for my main collections. A few weeks went by and I just could not think of the right coin. Then one day I was in my friend’s coin shop waiting for him to finish up with some customers. While I was waiting I was looking in the cases hoping something would catch my eye. Nothing stood out. Then she walked in. No not Liberty, a little girl, maybe seven or eight years old. She was accompanied by her father. I figured she was just tagging along with him. When the dealer saw them it was clear they had been there before, and that she was a collector! This got my attention! I love to see kids get involved with the hobby. The father told the dealer that his daughter had $15 to spend and that she was looking for Liberty walking half dollars. “That’s it!” I said to myself. I can purchase nice, uncirculated, 1940’s “Walkers” for around $30-$40 each. I could not go wrong with this classic design! The dealer gave the young lady a really good deal, two earlier date Liberty walking half dollars in VF for $13.50 (melt). When the dealer was finished, I looked through his box and picked out two beautiful half dollars. The first a 1936 in AU58 grade; and a gem BU 1946 with tons of luster. The Liberty walking half dollars (also called “walkers” by some), were designed by Adolph A. Weinman. This design replaced the Barber half dollar in 1916, and continued to be minted through 1947 after which it was replaced in 1948 by the Franklin half dollar. 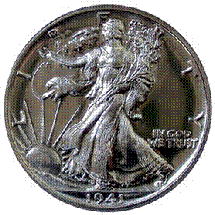 Weinman, a German immigrant, also designed the Winged Liberty, or “Mercury” dime (1916-1945). Miss. Liberty is depicted walking to the viewers left, towards the raising sun (a new dawn). These coins were minted at three Mint facilities, Philadelphia (no Mintmark), Denver (“D” Mintmark), and San Francisco (“S” Mintmark). In 1916 and part of 1917 the Mintmarks (if any) appear on the front of the coin, under the motto “In God We Trust”. For the remainder of 1917 through 1947 the Mintmark appears on the back of the coin, at the 8:00 position. The designers initials “AW” appear on the back at about the 5:00 position. The reverse or back of the coin depicts a Bald Eagle standing, facing to viewers left. The eagle’s wings are slightly outstretched. On some coins the design on one side is attractive, and the other side is unattractive. However in my opinion both the obverse and reverse of this coin are very beautiful. If you are considering building a full set of Liberty Walking half dollars you should know there are some scarce or “key” date coins in this series. Right off the bat, 1916 had fairly low mintages, with the 1916-S being the lowest of that year at 508,000. In 1917 mintages range from a low of 765,400 to a high of 12,292,000. These numbers remain the high and low points until 1921, when mintages took a big dip. The 1921 Philadelphia coin had a mintage of 246,000. The 1921-S had a mintage of 548,000. But the 1921-D has the lowest mintage of the series at just 208,000. After 1921 mintages remained above the one million mark with only one exception, the 1938-D which had a mintage of 491,600. Collectors with smaller budgets might consider a “short set” from 1940 to 1947. These years are easily found in uncirculated grades such as MS63 to MS65. Look for coins with good luster, and good strike. There are a few places to check for strike sharpness. First is Miss. Liberty’s head. You should be able to make out the features of her face when viewing the coin with magnification. Second look at Miss. Liberty’s left hand. This hand is in higher relief because the body is behind it. Make sure you can make out the fingers on her hand. Another important place to check is the skirt lines in the very center of the coin. Often these lines are missing, or weak. Turning the coin over you will note the eagle’s chest is the high point of the design. On Some coins the eagle’s chest is flat. Look for coins with well defined feathers on the eagle’s chest. If you follow these tips, your uncirculated short set will be sure to wow your fellow collectors. The design on the Liberty walking half dollar is so popular with collectors that in 1986 the obverse design was adopted for the silver American Eagle bullion coin. This time the portrait was depicted larger, and is always well struck. The reverse design from the half dollar was not used however. Each Eagle is one troy ounce of .999 fine silver. These bullion coins have a face value of $1; however their current (December 2009) value is about $25. The silver Eagle has been minted in bullion form every year since 1986. There is a key date in this series as well, the 1996 bullion piece. These sell for upwards of $40 each. The Mint has also produced proof and more recently uncirculated versions of the silver Eagle. While not all coins carry a mintmark, they have been struck at Philadelphia, San Francisco, and West Point Mints. Silver Eagles make a great addition to your Liberty walking half dollar collection. So if you are in search of a new numismatic avenue to pursue, try walking with Liberty! She has witnessed two world wars, the roaring ‘20’s, the Great Depression, and much more. And she is more than willing to share her story with you! Mintage information in this article quoted from A Guide Book of United States Coins, 2010, 63rd edition.